Home » Product Reviews » Review: La Roche Posay Anthelios XL Fluid Cream Sunscreen – me loves you! Review: La Roche Posay Anthelios XL Fluid Cream Sunscreen – me loves you! I got the Anthelios XL in the cream version. Its supposed to be more suitable for those with dry skin and I tend to agree. If you have normal or oily skin, go with the light version – you will find this one too heavy and oily. For me however, its perfect and it does melt right into my skin as it says on the tube. The La Roche Posay Anthelios XL carries a SPF50 and has UVA and UVB protection. The active ingredients are Mexoryl (chemical UVA blocker) and Titanium Dioxide (physical UVB blocker). This makes this a combination chemical and physical sunscreen. The cream is thick, I will concede but it does melt right into my skin and I do not get oily at all during the day. I initially thought it might be the Vichy Pore Refine Essence that I use every day but when I did not use it, I too did not get oily. It might then be that my skin is drier than I’d expected but whatever it is, this sunscreen fits it to a T.
There is also no smell and no white cast. When I wear this and wander out in the sun, my skin does not burn and I do not turn red. I like that. I’m not into tanning and I’m so fair I’d burn easily. This sunscreen is also what I attribute to keeping my freckles/pigmentation at bay! They aren’t becoming any worse. Or maybe its just that I use sunscreen all the time so I’m keeping the damage at bay. It does say that it has a cellular protector and is water resistant and does not contain parabens so you can take it swimming or to the beach if you like. I’ve been wearing this everyday and so far, no breakouts and no reactions have appeared. It must be said that I’ve never experienced any breakouts with products containing Titanium Dioxide or Mexoryl which is why I liked the L’oreal UV Perfect sunscreen previously until I moved on. Now for the dupe. A passable dupe I’ve been testing out is Vichy UV-Activ sunscreen available locally in Malaysia. Its not quite as thick as the La Roche Posay and also uses Mexoryl and Titanium Dioxide as its blockers. It too sinks into my skin and does not leave me oily but like La Roche Posay fluid cream, I may not recommend it for those with oily skins. I’ll run a more comprehensive review on this one in a couple of weeks. How’s Friday been treating you? I woke up with a heavy head and its turning into a headache so all I want to do is crawl into bed! 🙁 Unfortunately I’m having dinner with a friend who’s celebrating a birthday tomorrow – I wonder if wine will make the headache go away? 😀 Now for the eternal question – where do I go for dinner? Japanese or French?! PREVIOUS POST: Ask & Answer : How to use foundation to minimize wrinkles? NEXT POST: 8 hours in Singapore – the damage! Japanese! Should be healthier ?.. I’ve been reading about this sunscreen, and it seems to be the best in the market. And from your review, sounds like it’s living up to it name. But the price’s too steep for me. It is about the best for me now! 🙂 Its steep but worth every cent! Any recommendations for sunscreen with zinc oxide ? Yes I’ve read about Zinc Oxide too – there are a few in the market. ROC and Uriage have mineral sunblocks. Dior has a Zinc Oxide based one and Sunplay Skin Aqua uses Zinc Oxide too. I have some thoughts about this which I hope to post at a later date. In essence, I’ve realised that Zinc Oxide may not be good for my skin – broke me out. I find that the L’Oreal sunscreens are more moisturizing, and they contain both Mexoryl SX and XL, which are both high grade UVA and UVB blockers and are more moisturizing than the Anthelios. I use the Anthelios on my feet, which always turn darker than my legs! Do you mean L’oreal UV Perfect? Both LRP and Vichy are under L’oreal too hence the presence of Mexoryl 🙂 I’m quite happy with how Anthelios feels at this point though. But I do use a separate moisturizer. I’ve never tried anything else from their line because we don’t get it. But the sunscreen’s a winner! i feel for you! why don’t you have it in malaysia????!! i love this and also the avene sunscreen. i’m the opposite of jamilla, my legs tend to stay so white but my arms get red so easily. i don’t get it hahaha. Thanks for the review, I may have to check this out! I had the LRP spray on sunscreen, and hated it because its just too mattifying. In fact it seems all their suncreens I’ve tested in store have this weird powdery mattifying effect, does this have that feeling too? I know which texture you mean and I hate it too – its usually present in the sunscreens in liquid form due I think to alcohol. This is a cream texture which is recommended for drier skins. omg! i had no idea these were available in Singapore. Thank you sooo much for this little piece of info. i’ve just started to use the Fluide Extreme version, which I bought in Paris and have only 2 backups of. I was bummed to think that when I finished the last one I’d have to go find a new sunscreen. LRP is so highly recommended on MUA that I would hesitate to go back to other brands. However, I’ve found some interesting new sunscreen offerings at Watson’s: Neutrogena’s got a bunch of new sunscreens under their fairness range that incorporate the Helioplex thingy, which is supposed to make the sunscreen photostable. Worse comes to worst I’ll probably try that one out! I haven’t looked at Neutrogena’s new range but so far, Vichy is ranking quite highly in my sunscreen books! I live in London and this weather is horrible for my skin. Everytime taht I go home I vist the dermatologist who suggests to use NOTHING but sunblock. I have microdermabrasion everytime I see her and she keeps telling me that the only thing i should wear is sunblock. I have tried so many different sunblocks!!!!!! And all of them clog my pores and make my skin dry. My skin just hates sunblock! I tried: Avene sunblock. Decleor. Prozone. Cetaphil. Even Creme de la Mer sunblock. I dont know what it is exactly that my skin doesnt like, so i think i should try chemical sunblcoks and screens separetly. Is the one from loreal only chemical? I would love an advice from a sunblock expert!!!!! I have thrown my box away and I don’t believe this product contains Oxybenzone but I stand to be corrected. For Sun screen I strongly recommend people who have oily or combination skin to use Anthelios XL UV, it won’t clog your pores and is good for sensitive skin too. Recently, I also started using their Thermal Spring Water which naturally rich in selenium so far so good less breakout nowadays! Have any of you ever tried Prozone sun screen from MicroDerm it makes wonder very powerfull yet very nice to wear and best of all it is spf100 uva and uvb blocker special for oily to mild kind of skin and it is not chemical. where in singapore can one buy the la roche-posay anthelios XL? Look in Guardian pharmacies. That’s where I got mine. 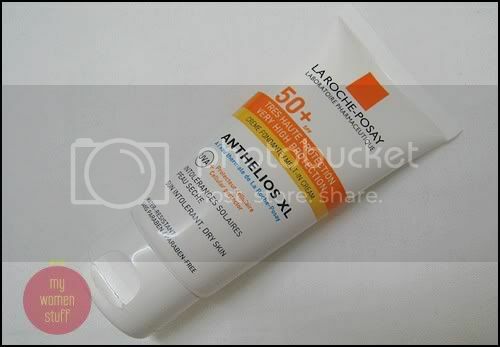 can anyone tell me where i can buy La Roche Posay Anthelios XL sunscreen in malaysia? HOW IN THE HELL DO YOU GET THIS WORK FOR YOU?! D: This is one of the worst sunscreens in the world = obvious white cast, it wont stay on my skin (it flakes off like eraser rubbings), and it breaks me out 🙁 The most annoying thing is the white eraser-rubbing-like flakes that exist all over my face… definitely not attractive at all! I’m not sure about that, but I wear makeup most days of the week.